Our beautiful cruise came to an ugly end. No, they didn't have to carry me off the ship screaming and kicking. I was on my way to see more grandkids. But the debarkation or disembarkation, whichever term you prefer, was absolutely the ugliest I've ever seen. Immigration officers boarded the Celebrity Constellation early Sunday morning (at 7 a.m.) to do their passport check on board ship. That's when the fun began. We were all given times to appear at the theater to cut down on congestion. 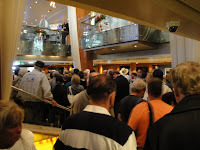 Either it was slow starting up or people ignored their times but when we arrived at our appointed time, the line was already from one end of the ship almost to the other. It moved along quickly though. Somewhere came a hangup however and at 10 a.m. the ship was still not cleared to let passengers off. Announcements calling for several people to report to immigration were made. It was finally down to two people and for a moment I thought there might be a posse sent out to find them. At 10:15 or so, the announcement was made that the ship was cleared. 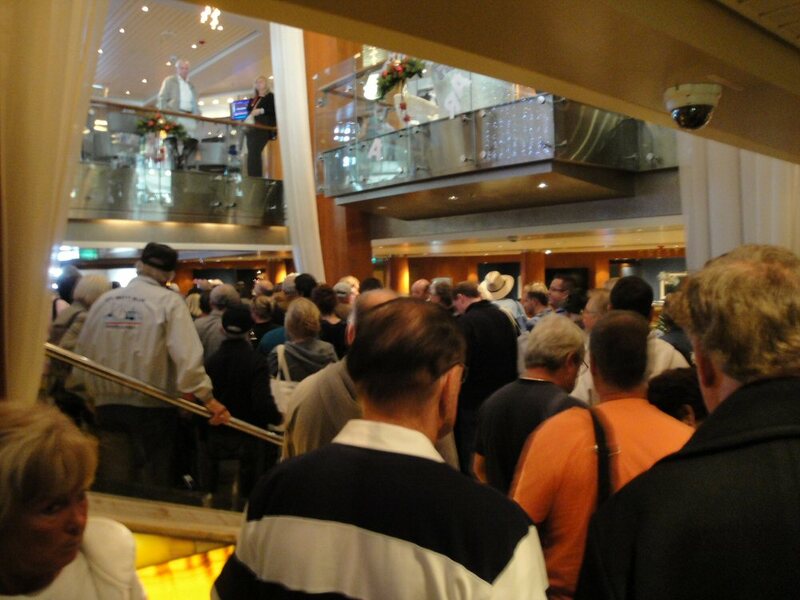 But by then people had flooded the atrium area and even though we were told our group could leave, there was no way to get to the gangplank. There were a lot of questions that arose as we inched our way out finally at 11:45--fifteen minutes before our plane was to board at the San Diego airport. Needless to say, we didn't make our flight and were on stand-by until we got one at 9:30 p.m. In the meantime, we had been through security once but decided that we wanted to check out the restaurants outside of security. We left our concourse and ate and then returned. On our earlier pass through when lines were longer, the body scanner was not in use but this time we were treated to a thorough scan. Just my luck, I got held up. The TSA agent kept asking if he had missed hearing me cleared. Finally the answer came that there was something in my pocket. My cruise card!! It must have picked up the mag strip. This week I saw an article on special underwear that you can wear now for going through the scanner. It has the fourth amendment (all about privacy and unneccessary searches) printed on it in a special ink that the machine can pick up as it scans. Hmmm. With that sort of idea it could lead to all kinds of interesting designs, sayings, etc. for the scanners to detect and deliver to those secreted away looking at all the pictures. Guess it would make their job a little more interesting. Dubai to Southampton to New York - It's a Cruise!